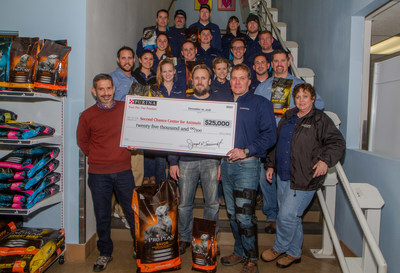 FLAGSTAFF, Ariz., Dec. 21, 2016 /PRNewswire/ -- Second Chance Center for Animals is expanding its enrichment and training programs for shelter dogs with the opening of its Canine Sports Arena, made possible by a $25,000 donation from Nestlé Purina, a global leader in pet care with a facility in Flagstaff. "We are thrilled to partner with Purina to save the lives of more dogs and cats," said Sean Hawkins, Executive Director of the non-profit Second Chance Center for Animals. "Renovating our outdoor play yards to create the Purina Canine Sports Arena will allow our kennel coaches and volunteers the opportunity to spend more time training and interacting with the shelter dogs, teaching manners and skills that help the dogs find homes and stay in those homes," according to Hawkins. In an effort to find every pet a home before Christmas, Second Chance Center for Animals is waiving all adoption fees for dogs, cats, puppies and kittens now through Dec. 24, 2016, celebrating its campaign "Home for the Holidays." 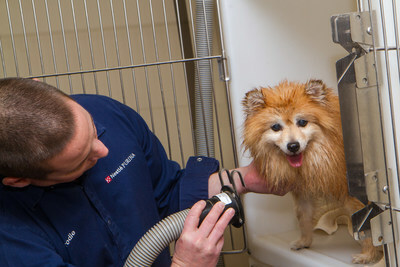 Every adoptable pet has been examined by a veterinarian, spayed or neutered, vaccinated, and micro-chipped. Pets available for adoption can be viewed at www.SecondChanceCenter.org/Adopt. The shelter is open from 11 am to 6 pm Wednesday through Sunday, but will be closed on Christmas Day. "Pets are our passion at Purina, and we are so excited to be sharing our commitment to pet welfare and helping shelter pets find a loving home by supporting Second Chance Center for Animals," said Casey Hansen, Plant Manager for Nestlé Purina in Flagstaff. "In addition to the grant funds and volunteer support, Purina is providing every dog or cat adopted during Home for the Holidays with a supply of Purina food and a special gift basket with treats and toys." We believe the safest place for every dog and cat is in a home. Part of Second Chance Center for Animals' unique mission is to "rescue from the rescues." We partner with 35 organizations across Arizona, Colorado, New Mexico and Utah who transfer homeless dogs and cats to us for adoption. Since 2004, more than 10,000 dogs and cats have found forever homes through Second Chance. Our state-of-the-art facility, knowledgeable staff, and passionate volunteers make our 100% placement guarantee possible. For more information visit www.SecondChanceCenter.org.